Colin Aitchison has sent me the sad news that sax player and clarinettist Grahame Shepherd has died in Spain. Grahame, who studied at Newcastle's College of Arts and Technology in the 1970s played baritone with the Newcastle Big Band as well as clarinet with the Phoenix Jazzmen. 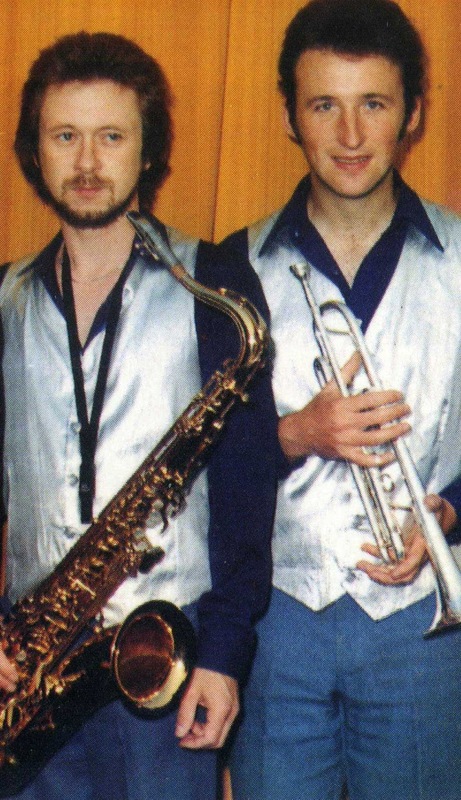 He and Colin also played summer seasons with the Steve Stephenson Show Band. There's also a YouTube clip of him playing in more recent years with a Pink Floyd tribute band. I don't know much more at present so will be grateful for any further information. A fine player who will be sadly missed by all who knew him. Shocked and saddened to hear this. Grahame and I were around the same age and played together many times in the early '70's, notably at the sessions at the Gosforth Hotel. He was a great saxophone player and a good jazzman (which doesn't necessarily follow), particularly on tenor, so he and I had a bit of friendly competition going there. Sad news. I was very sad to hear of Graham Sheppard's untimely death. I sat alongside Graham in the Newcastle Big Band sax section from about 1972 to 1974 and we took part together in the Big Band's visit to the Pau Jazz Festival in France round that time. Graham was a good friend and a great saxophone player, but I particularly remember the fluency of his clarinet playing which owed a lot to his mentor Sid Phillips, with whom he studied in London before moving to the North-East. I recollect sitting in with a mainstream jazz group which Graham co-led with saxophonist Nigel Stanger at the Gosforth Hotel on Wednesday evenings - perhaps this is the group that Steve Andrews recalls. (If I remember correctly, the band was called Splinters, because it was a splinter group from the Big Band). I was very much indebted to Graham for furthering my career as a young musician because, as a teenager, he frequently invited me to deputise for him in the Bavarian Bierkeller Band at the Hofbrauhaus on Waterloo Street, thus giving me the opportunity to play next to the great trumpet player, Bobby Carr. Graham was a great guy and a great musician who will be sadly missed. Thanks for letting me know about Graham, very sad. Graham played with the Phoenix Jazzmen for a couple of years before leaving to join the house Oompah Band at the Hofbrauhause Club in Waterloo Street. He was an excellent musician and played clarinet and tenor sax with the band, - I think he also played baritone in the Newcastle Big Band. The Phoenix line-up at that time was Don Eddy on drums, Gordon "Sting" Sumner bass, John Hedley guitar, Graham on reeds, Ronnie Young trumpet and vocals and myself on trombone. I remember this band produced a really big sound and looking at the rhythm section I'm not surprised! I'm sure Graham will be sadly missed. We played with Grahame every week for the last five years here in Spain, such a fantastic and soulful musician who played with an ocean of feeling on his tenor and flute. We will always cherish his memory. RIP dear Grahame. College mate, band mate, loved his playing, modest to a fault and a decent man. I'm listening to The Phoenix Jazzmen's biggest hit record: Beale Street Blues. Graham, what a gem. Great to have known you mate. the College in Newcastle have already departed. It is all very depressing. Do you happen to have an email address for Colin Aitchison? He was in Hong Kong last I heard. He was also at college with Grahame and I all those years ago. God, I feel old. Colin, I'll email you Colin Aitchison's address.